Growing beard is one thing, but maintaining its look and appearance is another different task. The use of beard oil in maintaining the looks of your beard and keeping it in a healthy state is a lifestyle you should greatly adopt. Beard oil is a product in the market which is suitable for all men (be it a business man or an entrepreneur) who are growing beards but did not quite have the proper knowledge of taking care of them. If you are an example of a man that does not really cherish his beards or lack the knowledge of taking utmost care of it, then count yourself fortunate for coming across this post. Beard oil have been termed as a product which can help millions of men in the whole world to take care of their beards more perfectly on a daily basis. Before we proceed further, i will like to make a clear explanation on this fact. Beard oil does not have the ability of helping you to magically grow a beard, but it is necessary for the daily care of your facial hair. Beard oil is made up of base oils like almond and grape seed oils. Adding to to the base oils are essential oils from plants, flowers or trees, which are responsible for its fragrance. If you are just growing or developing a beard for the first time and you are searching for a beard product, then take a look at these 4 reasons why you should choose or use a beard oil. Like we all know, a beard can make men look older than their original age. Regular use of beard oil rejuvenates the face and the general appearance. What gives health to the beard of men is his healthy skin. The dirt that gets into the beard can cause the facial hair to become dry and frizzy. Beard oil have the potency of hydrating and softening the skin. Beard oil prevents dandruff from occurring on a regular basis by getting into the roots and follicles of the hair to produce a very healthy beard. If you discover that your beard irritates and itch a lot, then you should use a beard oil. Making use of beard oil on a daily basis will reduce the itchiness and it conditions more better than simple shampoos and conditioners. You should also note that beard hair is not the same as head hair. The beard hair is thicker and coarse than the head hair, so using a beard oil for its main purpose is proper. Even these bearded billionaires have a good or bad beard day. Beard oil will restore that vitality, shimmer and rejuvenation by creating a very healthy beard. Beard oil oxidizes; it does not evaporate like a water based product which is why it is better than using a simple conditioner. The oil will get absorbed into your skin and stay in the beard for a long time without flakiness or dryness. Unhealthy skin conditions will not help a beard grow faster or help the beard stay healthier. 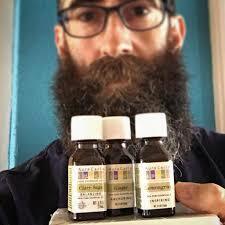 Beard oil creates an optimal setting for growing beards. In addition, a man's general health, diet and lifestyle will produce the optimal conditions for growing facial hair. Beard oil hydrates, conditions, and promotes healthy growth. Keep that bright appearance, maintain a healthy beard, use a beard oil. Share this post to as many men that will be needing them.